Acapulco, MEXICO (February 19, 2010)—Those who knew Nick Gallo knew how cool he thought Mexico Boutique Hotels were. We at MexicoPremiere.com agree completely, and we just confirmed their “coolness factor” when MBH director, Sylvie Laitre, called to tell us the insanely fabulous Hacienda de los Santos had agreed to be a part of the 2010 Nick Gallo Award. We’re giddy with excitement, so let us share just a few tantalizing tidbits on Hacienda: Built in the 18th century for a wealthy silver baron, current owners Jim and Nancy Swickard lovingly restored the Hacienda de los Santos to its former glory. The couple, though, looked beyond the structure and the creature comforts to transform it into a cultural center and healthful retreat, championing the lovely town of Los Alamos and its citizens through community programs and offering its guests plenty of outdoor pursuits, indulgent spa services and wholesome, delectable dining. The winner of the 2010 Nick Gallo Award will score three nights in a luxurious Hacienda Master Suite; daily full menu breakfast at the Agave Café (no puny Continental Breakfast here); two massages; two fine dinners and the pièce de resistance: a one-hour aerial tour of the Sierra Madre with pilot and owner, Jim Swickard. Note to writers: you love Mexico, we love Mexico. Let’s show the love and show the world this destination is so much more than hype and bad headlines. The 2010 Nick Gallo Award will be handed out during SECTUR’s Tianguis Turístico convention, held from April 25-28 in the Acapulco International Center. The winner of the 2010 Nick Gallo award will receive an engraved plaque created by Laurie Brown-Gallo plus a three-night stay for two in MBH’s Hacienda de los Santos, including air from their closest U.S. gateway courtesy of Aeromexico. Entries are only open to freelance writers based in the United States and Canada. For more information and details, visit www.MexicoPremiere.com. Nick Gallo, two-time winner of the Mexico Tourism Board’s prestigious Pluma de Plata award, regular contributor to such prestigious titles as Travel & Leisure, Alaska Airlines Magazine, United Airlines Hemispheres, Private Clubs, Northwest Airlines WorldTraveler, father, husband and matchless colleague, passed away in October 2007 while on assignment in Greece. A touching in memoriam written by fellow writers can be found at www.MexicoPremiere.com/?p=256. 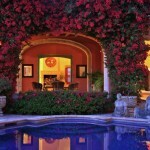 Book any of Mexico Boutique Hotels’ stylish properties by calling 1-800-728-9098 (US and Canada) or visiting www.mexicoboutiquehotels.com. 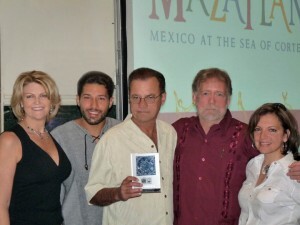 Lisa Coleman, Alex Gallo, winner Dan Millington, David Simmonds and Lydia Gregory at the 2009 Nick Gallo Award presentation in Acapulco, Mexico. Anyone interested in Mexico has probably run across a travel article by Ron Butler at one time or another. He wrote extensively and passionately about his wanderings south of the U.S. border, and his articles were published in numerous newspapers and magazines. Ron is perhaps best known to Mexicophiles for his book Dancing Alone in Mexico: From the Border to Baja and Beyond, which chronicles his solo journeys in Mexico after his wife left him with their two children. Ron also won the prestigious Pluma de Plata award for his outstanding travel writing. Ron Butler died, reportedly of a heart attack, earlier this week at his home in Tucson, Arizona. He was 77 years old. Inclusions: Accommodations for 2-nights and meals at El Careyes Beach Resort, Costa Careyes, Mexico. One spa treatment (not massages) and complimentary usage of sea kayaks or horse back riding. Exclusions: Airfare, transfers, tours, meals outside El Careyes, alcoholic beverages (beer, wine, champagne). Phone calls, mini bar, incidentals and personal purchases. One travel companion welcome when sharing a room with working journalist – their expenses are responsibility of the writer. Journalist Requirements: Writers with an assignment for articles related to luxury travel, romance, destination wedding and honeymoon, spa and wellness, high-end family travel, active lifestyles travel, Costa Careyes destination, and groups/meetings/conventions will be given priority. Applicable to writers with assignments for A-list national print publications (100,000 circulation or more), online publications with large monthly unique visitors (200,000 or more) and/or weekend travel features in daily newspapers. Journalists will be considered based on the criteria of national exposure, circulation of publication, and letter of assignment. Freelancers with more than one confirmed assignment for publications matching El Careyes’ target markets will also be given preference. Description: Professional travel writer on assignment are invited to discover the magic of the elusive Costa Careyes on a two night getaway the barefoot luxury escape, El Careyes Beach Resort. Editors also welcome. Contemporary Mexican décor compliments 51 cozy guest rooms, which feature cool tile floors, colorful textiles adorning beds and sofas, an artwork collected from around the country. Many suites also boast open terraces with flower-strewn private Jacuzzi tubs overlooking the stunning cove where guests enjoy a host of non-motorized watersports, including snorkeling, kayaking and deep sea fishing. Unmatched congenial service extends from the open air lobby, where check-in includes an icy, fresh fruit made welcome cocktail, to La Lantana poolside restaurant, where the atmosphere shifts seamlessly from casual beach to fine dining among intimate elegance once the sun sets on the ocean. And sophisticated and soothing therapies greet the senses at the onsite spa, which features a tempting Jacuzzi tub and vapor room. Journalists are encouraged to visit El Careyes throughout the available dates and submit their assignment letters as they receive them to discover personal experiences and make the trip one that you can write about again and again.